An international research team from Russia, France and Germany has proposed a new method for orienting liquid crystals. It could be used to increase the viewing angle of liquid-crystal displays. The paper was published in the journal ACS Macro Letters. "This is first and foremost a fundamental study exploring the mechanisms of liquid crystal orientation," says Dimitri Ivanov, the head of the Laboratory of Functional Organic and Hybrid Materials at MIPT. "That said, we expect that these mechanisms might have applications in new LCD technology." Most solids are crystals. In a crystal, molecules or atoms form an ordered three-dimensional structure. Unlike solids, liquids lack this internal long-range order, but they can flow. Matter in a liquid-crystal state has properties that are intermediate between those of liquids and crystals: It possesses both the molecular order and the ability to flow. A liquid crystal can thus be viewed as an "ordered" liquid. Not all materials can exhibit a liquid crystalline state, and the phase transition mechanisms may vary. Among other things, the molecules of an LC material have to be anisometric—that is, rod- or disk-shaped. Some compounds become LCs in a certain temperature range. These are called thermotropic. By contrast, lyotropic LCs adopt the liquid crystalline state when a solvent is added. The properties of an LC material vary depending on the direction. For example, polarized light propagates in a liquid crystal at different speeds along different directions. Also, in an electric or magnetic field, the orientation of LCs can rapidly change. This phenomenon is known as the Fréedericksz transition. Thanks to the optical properties of LCs and their ability to be easily realigned, they are widely used in the electronic displays of TVs, computers, phones, and other devices. In an LCD, the image is generated by changing the intensity of light in each pixel via an electric field, which realigns liquid crystals. There are several LCD configurations, but the one most commonly used is based on twisted nematic LCs. These are rod-shaped thermotropic liquid crystals that can adopt a twisted configuration by using special aligning substrates. Applying an electric field to these LCs can untwist them. This reproducible and predictable response can be used to control light intensity. Each pixel in a color LCD consists of three subpixels: red, green, and blue. By varying their intensities, any color can be displayed. 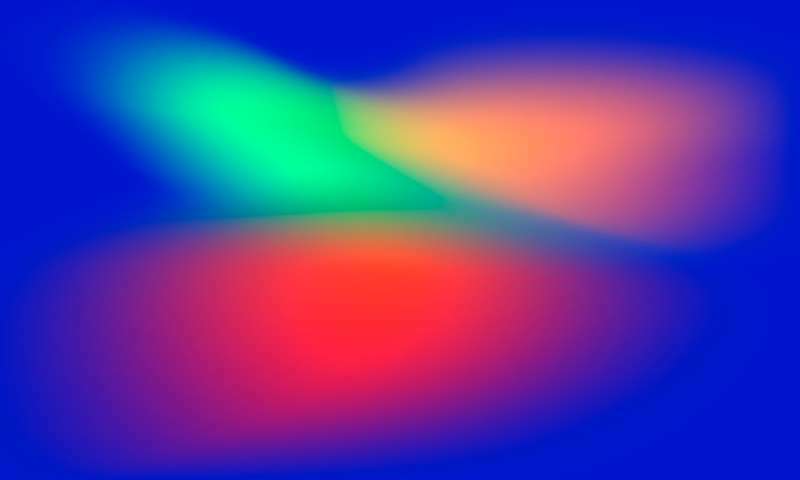 A subpixel in a twisted nematic-based LCD (figure 1) consists of a light source, a color filter, two polarizers, and an LC cell between two glass plates with electrodes. 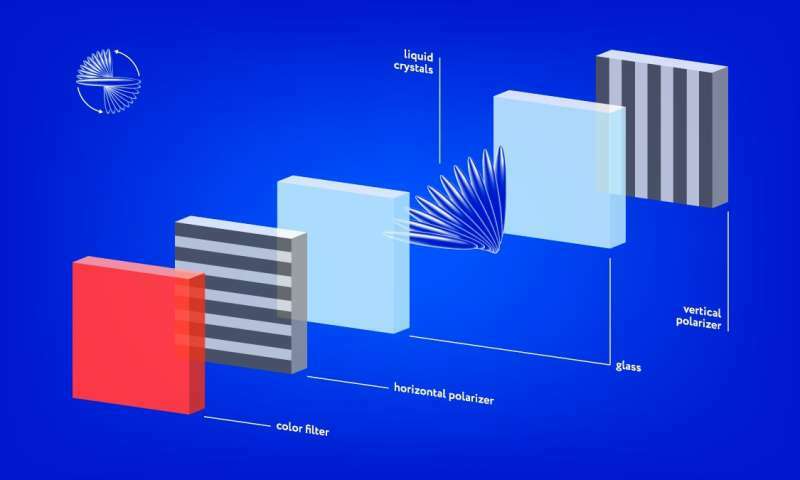 If the liquid crystals were not there, no light would pass through the cell, because whatever light is let through by the vertical polarizer would be blocked by the horizontal polarizer before reaching the color filter. However, special substrates with groovy surfaces can be used to twist LCs in a spiral between two polarizers so as to turn the light precisely by the amount needed to pass through the second polarizer. The fully illuminated state of the subpixel is actually its "off" state. When voltage is applied, the liquid crystals untwist, changing the light polarization to a lesser degree. As a result, some of the light is blocked. Eventually, as some voltage no light can reach the color filter, and the subpixel goes dark. One of the limitations of this technology is the viewing angle of a display: From a sideways perspective, the LCD will not render the colors accurately. This is due to the co-alignment of liquid crystals. The issue can be solved using multidomain displays, in which pixels belong to a number of domains, whose LC orientations are different. This means that at least some of the domains are always oriented in the right way. The international team of researchers led by Professor Dimitri Ivanov, who heads MIPT's Laboratory of Functional Organic and Hybrid Materials, has proposed a brand new solution for multidomain display design. The authors of the paper worked with liquid-crystal polymers. These are substances composed of long molecules with a chainlike, repetitive structure. A slight variation in the structure of polymers can drastically alter their orientation on the substrate. The polymers used in the study are poly(di-n-alkylsiloxanes), or PDAS. Each molecule is a chain containing alternating silicon and oxygen atoms. The silicon atoms in PDAS bear two symmetric hydrocarbon side chains (figure 2). The n in the name of the compound stands for the length of the side chains, which was varied between 2 and 6. In the experiment, polymers from the PDAS family were deposited on a Teflon-rubbed aligning surface with a regular pattern of grooves. Generally, crystalline polymers are known to align on such substrates, but only when the lattice parameters of the substrate match those of the deposited polymer. The researchers examined the orientation of the liquid-crystal polymer chains relative to the direction of the grooves on the aligning surface. The side chain length n was increased in steps of just one methylene group (CH₂) at a time. The researchers found that, contrary to expectations, the liquid-crystal orientation varied depending on side-chain length. At n equal to 2, the needlelike polymer superstructures known as lamellae co-aligned with the Teflon grooves. Because lamellae are known to be perpendicular to the polymer chains, the researchers concluded that the polymer chains are perpendicular to the grooves on the substrate (figure 3, left). When n was increased to three, the orientation of the lamellae changed by 90 degrees, making them perpendicular to the grooves. As a result, the LC polymer chains were now oriented parallel to the grooves (figure 3, right). At n equal to four, no further change in orientation was observed. However, when the side-chain length was further increased to five and six, the lamellae again co-aligned with the Teflon grooves. 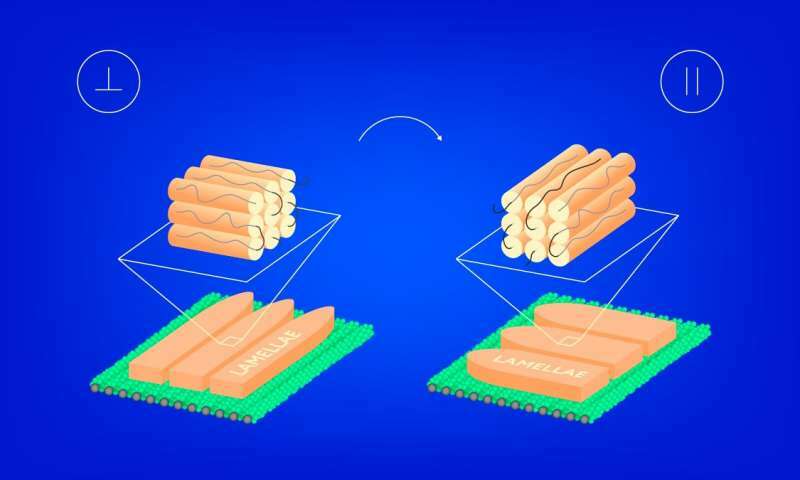 The researchers have thus found that by merely adding one methylene group to the side chain of the polymer, they could switch the LC orientation, which is crucial for most applications of liquid crystals, including LCDs. According to the authors, the effect they discovered could be used to design LCDs with improved viewing angles. This could be achieved using a multidomain technology that works by orienting subpixels of one color in different directions. As a result, the pixels compensate one another when the display is viewed at an angle, improving color rendition. The researchers expect this technology to be considerably simpler and cheaper than other multidomain approaches that are currently used.